RiverMaps are new guide books that use real USGS 7.5min topographic maps as a background at the original map scale of 2000 feet per inch. Additional information for river runners has been added to the maps, including river mileage, campsites, rapids, and other features of interest. Each map is oriented so the river flows upward on the page - no more turning your map upside down to read it! Their large format (9" x 14"), spiral binding, laminated covers and all weather paper make them durable and easy to use. These maps provide more information for river runners who want to see more of the river corridor. They're great for planning side hikes! 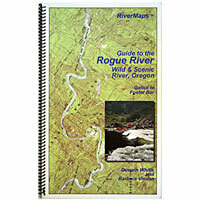 This guide covers the Wild & Scenic section fo the Rogue River from Galice to Foster Bar, Duwain Whitis.